I started doing the odd yoga class at local gyms for several years before joining a dedicated yoga studio in Bermuda in my mid-twenties. You could say I was having a quarter-life crisis at the time, classic millennial, and I was looking for something more. For the first month or two, I felt so lost and out of place in every class I attended, but something kept me coming back. Months went on, and my practice not only became more regular, it became part of my routine. My desire to be super flexible transformed into a desire to quiet my mind, and everyone at work knew that my lunch hours would be spent in the yoga studio. Almost two years on from those awkward first classes, I’ve lived out my dream of completing a 200hour teacher training and cannot wait to see you on your mat! 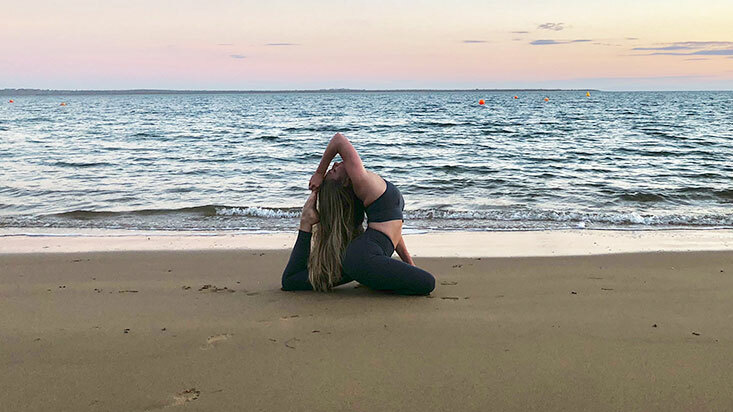 I’m currently living in Melbourne, Australia and enjoy practising at various studios around the city, with vinyasa still being my preferred style. Honesty, an open-mind, self-love and a sense of humour. It’s hard to pick only one! But The Surrender Experiment by Michael A. Singer was a recent read that I couldn’t put down.